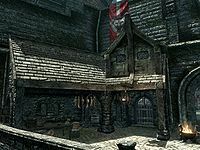 The Castle Fletcher is a store in Solitude that primarily sells bows and arrows. 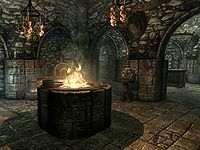 It is located on the outside of the walls of the Castle Dour courtyard, next to the Solitude Blacksmith. Fihada sells and buys bows, arrows, and other weapons; if Fihada dies, Jawanan runs the store in his place. NOTE: Like all other stores, the castle fletcher has a number of fixed wares on display scattered around the main trading room. These can be bought from the proprietor Fihada and will disappear from the room when purchased. For a list of these special items, see this section. Outside the shop there is a large selection of barrels, sacks and crate. Along with a wooden table with racks hanging above, these hold six rabbits and four pheasants. On the table is a woodcutter's axe. Upon entering the store you are faced with a large central firepit, with six garlic braids hanging over it and a piece of firewood on the stone edge. In the southwestern corner is a sitting area with a wooden bench and narrow table against the walls. On the table is a bowl containing a bunch of tundra cotton and next to this is an iron dagger. There is a low table in front of the bench holding a plate of bread and a sliced eidar cheese and a copy of the Archery skill book The Gold Ribbon of Merit. To the right of the bench, against the west wall is a cooking pot on a stand, with an archery target to the right of this. Further along the wall there is an alcove with a dresser and two sets of shelves holding merchandise. Opposite the firepit on the east wall is an unlocked door leading to the private residence, with a planter and dresser to the left, along the wall. The counter is to the north and extends three quarters the way across the room, which is where Fihada spends most of his time between 8am and 8pm. There are three loose coins on the counter along with a troll skull and an adept locked display cabinet containing merchandise. Under the counter is a bunch of tundra cotton, a baked potato, a salmon steak and iron dagger. There are more sets of shelves displaying merchandise against the walls behind the counter. There are also some foodstuffs on the shelves to the east. At the rear of the shop is another alcove with three locked display cabinets—one apprentice, one adept and one expert locked; all three contain bows. Through the door to the living area, immediately on your right, is Jawanan's bedroom with an unlocked chest, an owned single bed, wardrobes and a round table. There are a pair of iron boots, a couple of common books and a bunch of tundra cotton to be found here. Opposite the door to the shop is a unit with a bottle of alto wine, with shelves above holding cheeses. To your left is a table set for two with a seared slaughtfish and two salmon steaks, a bottle of alto wine, a potion of regeneration, bread and cheese on the table. There is an open crate beside it containing a sample of fly amanita, a gourd and an orange dartwing. In the southeastern corner in a tall vase is a snowberry bush, with a narrow table holding bread and cheese with an iron dagger on top. To the north are stairs up to the top floor. Upstairs there is a second snowberry bush, a wardrobe containing clothes with a horker tusk on top. Opposite against the west wall is a round table with the business ledger on along with a salt pile and solution of strength. Beside the table is a narrow table holding a couple of common books and more bread and cheese, with another iron dagger. Above this is a shelf with a bottle of Nord mead and a common book. the door to Fihada's bedroom is on the south wall and contains a double bed in the southeastern corner, with an open crate containing a potion of regeneration and a draught of strength. There are a couple of cupboards and a wardrobe in the room as well as a couple of tables and several shelves. On one shelf is a master locked strongbox and potion of regeneration and on the set of shelves are two slaughtfish scales, a potion of haggling, two bottles of frostbite venom, a bowl of void salts and two bunches of lavender. This is the merchandise found in the Fletcher's merchant chest. These items are only available if purchased from the merchant; they cannot be pickpocketed or stolen. They are restocked every two days. The Solitude Fletcher is one of the few vendors that can stock Daedric weapons, albeit only bows and arrows. The key to this store, Key to Solitude Fletcher, works on Proudspire Manor's back door. Pickpocketing the key from Fihada allows for access to Proudspire Manor (and the unusual gem inside) without purchasing the home. Fihada has the investment dialogue, allowing you to pay him 500 gold to invest in his store. However, investing in him has no actual effect—his gold is not permanently increased—because his merchant chest does not contain the PerkInvestorStoreUpgrade bonus gold. This page was last modified on 28 May 2017, at 02:25.